As individual plot holders we often work our plots to create our own little bit of paradise. In doing so each of us is also contributing to the overall beauty of our sites. ​It really is a case of the whole being greater than the sum of its parts. 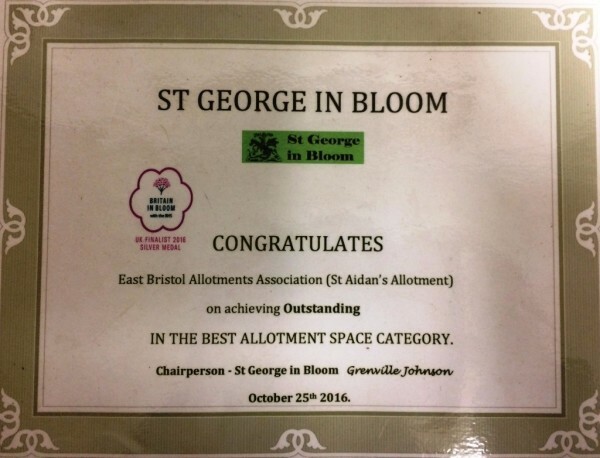 In celebration of this the BEAA enters into the Britain in Bloom Southwest and the St George in Bloom competitions each year. And, we have a lot to be proud of. In 2016 BEAA repeated its success of previous years, coming away with an Outstanding award in the It’s Your Neighbourhood category. Our St. Aidan’s site, as part of the St. George entry, won an Outstanding award in the It’s Your Neighbourhood category and Hope’s Friends of Kingsway youth received a Thriving award. The BEAA with others – known as the St. George Community – entered the St, George category and won a Gold Pennant for the 3rd year running. In the St George in Bloom competition St Aidan’s and Bell Hill did well; so too did a number of individual plot holders. 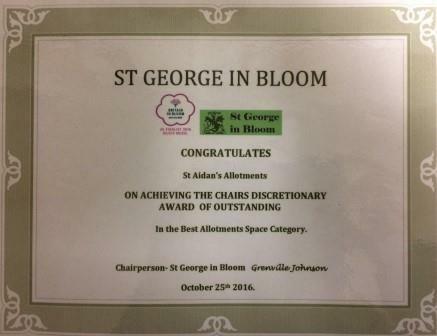 St Aidan’s was awarded an Outstanding award in the allotment space category and Bell Hill was awarded a certificate of participation. In addition to these achievements St Aidan’s site picked up the Chairperson’s Discretionary Award of Outstanding.